Corfe Castle - the odd animal seen over the past couple of years at the top of the Castle, but none seen this time. Thanks for the update Will, interesting! 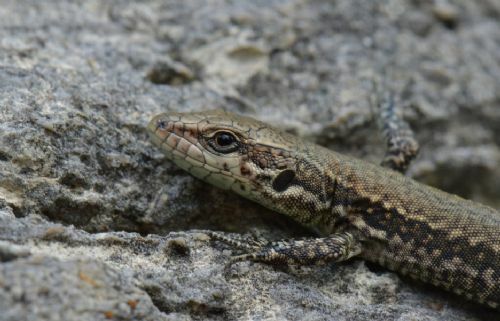 Thanks Mark; yes, it's interesting in particular to see how an egg-laying species of lizard which often chooses to lay eggs in cracks and crevices in walls, or under flat stones etc is faring when compared with the sand lizard and its more restricted choice of egg laying substrate - ie sand. I visited Boscombe on Wednesday hoping to photograph the Western Green Lizards but I couldn't find a single specimen. I'm wondering if reptile collectors and a couple of very poor summers have wiped them out completely now. Despite the cloudless sky and very hot temps there were plenty of Wall Lizards about though. I counted around 30 in two hours. Half of these were juveniles so breeding has obviously gone well this year. The adults were very wary and had to be photographed with a 300mm lens but the juveniles allowed me to get up to six inches away and shoot with a macro lens. more stunning photos as ever! as far as green lizards go, I found about half a dozen a couple of weeks ago, but they can be hard to find in hot weather (unlike the walls, which seem to be visible at all temperatures, just harder to approach when it's really hot, as you say!) I do think there are fewer greens than in previous years, due to cold summers, though I expect hatching success to be high this year. It will be interesting to see what numbers we see next spring. Thanks very much Will. It's very good to hear that the greens are still there. I'm surprised that I didn't even see any juvenile greens then on Wednesday. I'll have to try again when the weather is more suitable. It's a long drive from SE London / North Kent though. I spent the rest of the day at Studland looking for Sand Lizards to photograph with my 300mm lens. I failed to spot any of them all day either! It's a long way to travel, for sure! Sandies become hard to spot from August onwards, apparently some even start going underground before September, leaving the hatchlings and immatures on the surface. I have a smooth snake licence, but not one for sandies, otherwise you would have been more than welcome to come along with me. I think there are various reptile walks offered by the various experts in Dorset - ARC Trust etc - in springtime, so maybe worth asking in advance. Perhaps you could offer to give them the rights to some of the photos you take - a photo of a male in full breeding condition is great for publicity purposes - maybe send them a link to your website?